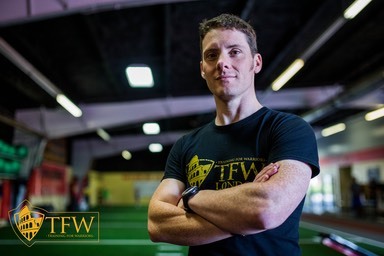 "I recommend�TFW London�to Local Mums. I was really worried about joining a class/gym due to low self confidence with how i looked. But joining TFW only three weeks ago has completely changed my mind. Everyone is lovely and Malcolm has really motivated me to change the way i think about food and exercise - and I’ve already lost over 10 pounds!�I would recommend this to everyone and if it was on every day i would go!!" WOMENS WEIGHT TRAINING: A cutting edge Weight Training routine designed to increase strength, build lean muscle and burn fat. HURRICANES: Our signature FAT BURNING WORKOUT! It will skyrocket your ability to maintain intense activity while melting fat for up to 48 hours afterwards. CARDIO STRENGTH: Cardio exercises coupled with strength exercises in a circuit format allowing you to burn more calories in less time. You’ll get a cardio workout at the same time as working on core strength and tone. Anyone can make you sore, not eveyone can make you MORE.